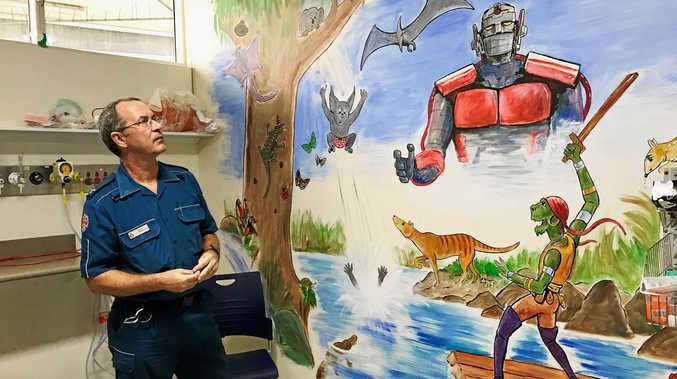 Patient transport officer Shane Foley created the mural for children visiting the emergency department at Bundaberg Hospital. HOSPITAL can often be a scary place for kids, but a splash of paint and some colourful creations by one local ambulance officer could change that. 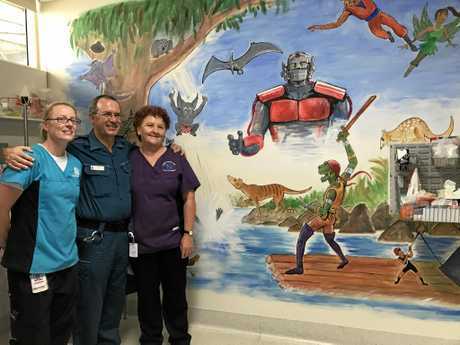 Patient transport officer Shane Foley has transformed the stark and bare walls of the Bundaberg Hospital emergency department paediatric area into a bright, action-filled mural. From fairies to fighting turtles and animals of all kinds Mr Foley, who is also an established artist, said he hoped kids would get a kick out of his art and help them feel more comfortable while being treated. "I was asked by the nursing unit manager if I could do it because the staff wanted something nice on the wall for the kids," he said. "I wanted to do something that was of interest to both boys and girls that would help distract them and keep them entertained. Hospital mural: A mural in the emergency department of Bundaberg Hospital has been painted for children visiting the area. Mr Foley said the mural took about 18 hours to complete. 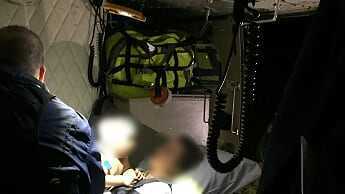 "I would come in early in the morning before my shift began and do little bits here and there every day," he said. "I started by drawing lightly on the wall with pencil, outlined it in acrylic paint and then went from there." Emergency nursing unit manager Sue Vanderberg said the mural had been well received by the hospital's young patients so far. "I have heard quite a few comments - the boys love the fighting turtle and and the robot and the girls love the butterflies and dragons," she said. Ms Vanderberg said the mural was a great distraction for the children. "Visual distraction is great because the children can focus on something that will take their mind off of what its happening."